/ Is the Mondo Cat Scratching Post the King of Cat Scratchers? Is the Mondo Cat Scratching Post the King of Cat Scratchers? If you have tried out standard cat scratching posts and found that your cat pulled them over then have a look at the Mondo Cat Scratching Post. 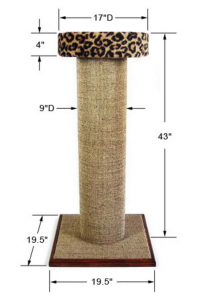 This incredibly high scratching post, made by Purrfect Posts, is probably currently the king of all scratching posts. 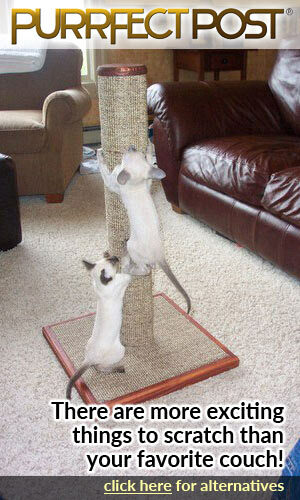 First, as standard scratching posts are only 24 inches in height your cat cannot get a full body stretch. Secondly, how many times has your cat grabbed the top of the post and then pulled it over? My cat, Dyson, is a largish ragdoll who used to pull over standard sized scratching posts. It is amazing how a cat can look at you with complete disgust as if to say ‘I was scratching where you wanted me to and look what happened’. One thing I had to watch was that she would not then use my wallpaper as a scratching area as she could then stretch out full length. “I started making Purrfect Posts in response to the multitude of requests I received from people asking me where to find the right scratching post for their cats. Height – Cats like to stretch full length which will pull the muscles in the back and shoulders. In the wild cats will use trees as their scratching posts. So a good commercial scratching post needs to be tall enough for large cats to stretch full length. 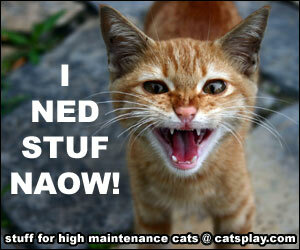 Sturdiness – When a cat scratches in the wild against a tree, it will not wobble or fall over. 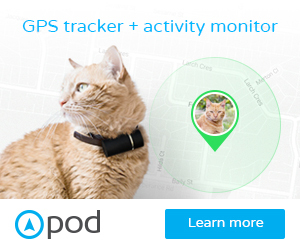 Therefore, your cat would like the same thing indoors. If your cat stretches full length and keeps pulling their scratch post over they are going to stop using it. Material – Again in the wild cats will scratch at bark which allows them to clean the old husks from their claws. The Mondo Cat Scratching post uses a sisal fabric which allows a smooth scratching motion rather than their claws catching on fiber. 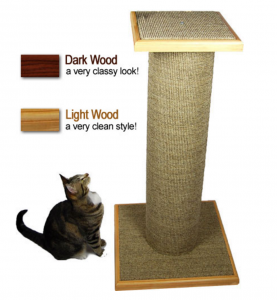 How does the Mondo Differ from a Standard Cat Scratching Post? Well, as I said above cat scratching posts are usually around 24 inches in height. 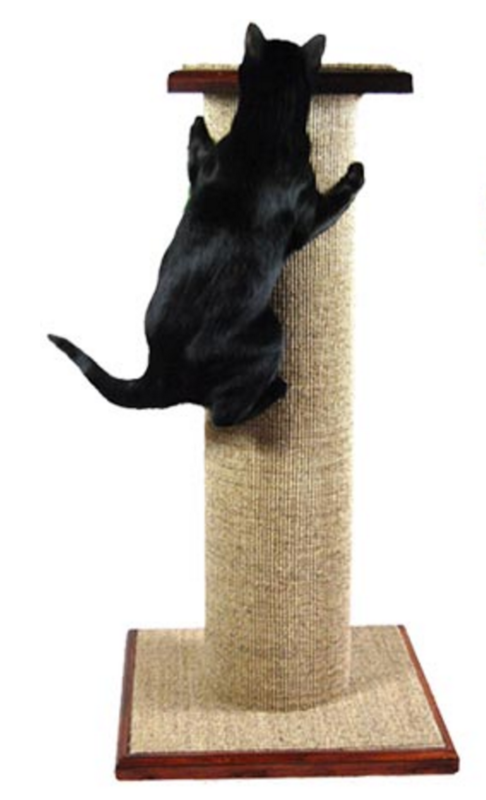 The Mondo scratching post is a massive 39 inches – over 3 foot – in height. 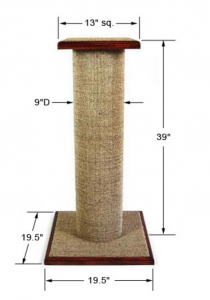 Your standard scratching post is also a narrow pole with a less than sturdy base. Meaning that when kitty is in a full-on scratching session they can pull the pole over – or it moves across the floor. The Mondo scratching post is actually 19.5 inches across the base. Furthermore, the post has anti-tip weight distribution inside it to stop it from tipping over. So more safety for kitty. Standard posts are also usually wrapped in a sisal rope. Whilst sisal is great for scratching, over time you find that the rope begins to detach itself and unravel from the post. Also because the rope is wrapped around the post, your cat will not have a smooth scratch as their claws catch in the next piece of rope. 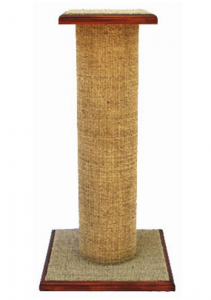 With the Mondo Cat Scratching post, the post itself is covered in a sisal fabric – so it makes a smooth scratching surface so no catching on bits of rope. Also if part of the post wears more than other parts the post can be rotated. Has a wooden finish in either Dark or Light wood. A Dark or light wood finish which matches the color of the rest of the scratcher. This platform is also covered in more of the sisal fabric so that your cat can sit and scratch. A leopard colored fabric with either the dark or light wooden finishes. This costs an extra $10. A cappuccino or leopard colored top round bed. This is a plush bed that can be used for perching or sleeping. This costs an extra $30. Well I couldn’t believe how big this thing actually was – it is massive. Even though Dyson is a large ragdoll she was dwarfed by this. Immediately she went up to it and started giving it the good scratch test. Then all of a sudden she realised that she could climb it as well. I might have breathed a sigh of relief as she used to love to climb curtains. The sisal fabric also seems to be very good. It does not seem to fray like the sisal rope did. After reading some cat forums where other large cat owners were using one of these, many of them say that it is still in perfect condition after months of use. I had the perfect place to put this scratching post as well. My cat loves the window in my workroom – however, it is quite high and she does not like to jump straight up. She was using a suitcase that I had left in front of the window to jump from. However, the window sill is not very wide and she can’t lie down up there even though she loves watching the birds from that vantage point. I was going to put a cat tree there for her to use as a sleeping and bird viewing platform. But as it doubles as my workroom there was not much space. The Mondo Cat Scratching post though is perfect for this area especially with the bed on top of it. It takes up less floor space than a cat tree and yet it is tall enough for her to reach the window. Win win. You can watch a video from the manufacturer here and see how well the post does. Overall this is a big paws up. It is definitely a pawsome scratching post. Quality scratching posts will be slightly more expensive than those you find in the local petstore but are much better made. We usually need to change our normal scratching posts every 6 months to a year as they start to fray and the rope unwinds. The Mondo scratchin post however, is going to last much longer. Have a look at Purrfect Post here and see if you can find your purrfect color match. That is the most comprehensive information I have ever seen concerning a cat scratching post. I like the fact that these posts are made in America and by hand. Sounds like a small company and a good one to support. If cats like trees this post is almost as tall as one and I have had the tipping over problem. What more could a cat want. The bed is great. I recently read a post about getting your cat to use the toilet. It’s a learn progression method with the end result of the cat using the toilet. Have you heard about or seen this product? It may be a little costly but I have found cheaper can cost more in the long run. My cat will be around for a while. Hi, this is interesting and I am going to tell my daughter about it. I know that cats love this, have seen this in my daughter’s home. They already have something of this sort, but this here seems to be more massive. I am not sure how this one remains stable when the cut jumps on it? Thank you. thank you for your comment. It gets its stability from a double thickness heavy wide base and the post has anti-tip weight distribution inside the post. This is an awesome product. I really want to get one to replace my cat’s regular scratching post. However, you’re right. It is on the expensive side. Though, as you mentioned already, it is a quality product. I will certainly try to put some money aside to be able to get one. The different options available are nice as well, will make it hard to choose, LOL… Our regular scratching post is fraying and I’m guessing the rope will soon give way. Thanks for a great review! Well I can tell you, if I had the money I would be buying a ton of stuff from here. I love my 2 cats to death. The products look really well made and its very easy to keep clicking one right after the other. 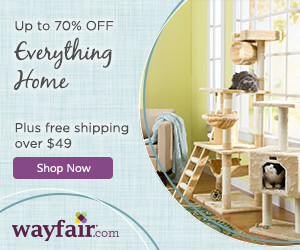 My cats would be so spoiled if i could get everything i want for them on this page. Great to see real time application of products. We all know about the cats that choose the box instead of what came in it. thank you for stopping by. I know what you mean by loving your cats to death. Dyson is so spoiled and she is enjoying trying stuff out for this site. I love cats. I have 4 of them myself. I used to have 6 but I gave two to my mom. It was getting to be a pain cleaning all those litter boxes, lol. I like your use of images and color. I also like how you put the social media links at the top and bottom of each page. I have to get those on my website but I am not sure of how to do that yet. One thing at a time. 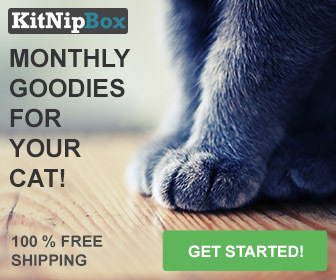 This is a very informative site and I will use it to learn more about how to take care of my cats. Cats are fascinating creatures, that’s for sure. I know cats don’t like to stay on the floor, and they love to dig their claws into your furniture. So, does the Mondo Cat Scratching Post serve as substituted for clawing your furniture? And, if so, how and why. I mean, it seems to me, yeah they would like the Post, but will it deter them from clawing other things. I guess you can tell I’m not too crazy about cats. From past experience, I seen them scratch things up an and they like to use the kitchen table as their personal playpen. Hi, this is interesting and I am going to tell my son about it. I know that cats love this, have seen this in my son’s home.